New European theater, German cinema, Ennio Morricone's concert, Plato's “The Republic” set to music, and more. A Dutch exhibition entitled "New Luxuries. Less + More in an Age of Austerity" is opening at the Moscow Manege exhibition hall. The exposition comprises 41 objects of art, including a chandelier made from ordinary light bulbs, a felled tree turned into a bench, and other examples of how improvised materials can be used to produce the impression of luxurious interiors. The organizers' idea: it is not expensive materials but rather bright, creative ideas that add the greatest value to objects. Luxury as we know it is a thing of the past; new luxuries result from unorthodox ideas and their creative implementation. The exhibition runs until 12 January as part of the Netherlands-Russia Year. Italian composer Ennio Morricone, the most prolific film score writer in the world, is giving a concert at Moscow's Crocus City Hall to celebrate his 85th birthday. 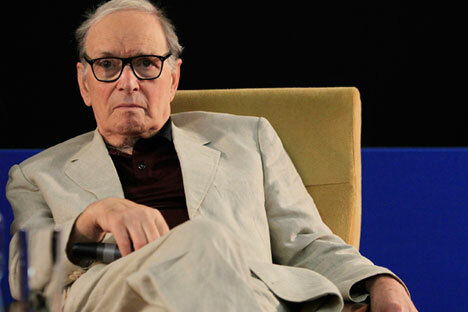 Morricone has composed for more than 500 motion pictures, including westerns, Italian neorealist movies, thrillers, TV series, and documentaries. Apart from classical Italian cinematography (the composer is most renowned for his score to the spaghetti western, “The Good, The Bad, and The Ugly”), Morricone has worked with Hollywood film directors, including Barry Levinson, Terrence Malick, Roman Polanski, Oliver Stone, Brian De Palma, and Mike Nichols. Goethe-Institut Moscow is organizing its first film festival in the Russian capital entitled "Blick'13: New German Cinema.” The festival will run from November 14 to at the Khudozhestvenny movie theater. The cultural center is planning to make screenings of German intellectual films into a regular event. The five movies to be screened this year are united by the common topic of relationships between parents and children. For example, the political drama “If Not Us, Who?” tells about the love story of Bernward Vesper and Gudrun Ensslin, which begins in 1968 against the backdrop of student unrest and ends in the creation of the pro-violence Red Army Faction organization. The festival features a retrospective of films for children and youth by director Arend Agthe. A musical interpretation of Plato's “The Republic,” one of the keynote works by maverick Dutch composer Louis Andriessen, is making its Russian debut at Moscow Philharmonic Hall. The concert, given by the Moscow Contemporary Music Ensemble, will also include “La Passione” (Monica Germino, violin, and Michaela Rayner, soprano). Andriessen will come to Russia for the occasion, and will give several master classes in Moscow and St. Petersburg. The 15th New European Theater (NET) festival is launching in Moscow. This annual event aims to introduce Russian theater goers with the most interesting and innovative European theatrical performances of the previous season. This year's program includes Peter Brook's “A Magic Flute,” an adaptation of Mozart's work of the same name for the Paris theater Bouffes du Nord; “Pedagogical Poem” by Teater NO99 from Estonia; Tonelgroep Amsterdam's “Scenes from a Marriage”; and “Albert Camus reads "The Stranger" REMIX” by DJ Pierre de Muelenaere.